I wish I could tell you the name of this lovely blossom, but its identity is lost somewhere in the chaos of my garden records. What I can tell you is that it is my second daylily to bloom this season. Most of the daylilies now have fat buds that look like they are about ready to pop. By this time next week, my garden should be well into daylily season, one of my favorite seasons of the year. Pretty day lily. I've had a nice time *catching* up with your garden this morning. Fascinated by the hibiscus mystery! Wow! Glad to hear the news about your lemon tree. We cut back our lime trees to the ground. I'll keep hoping! We didn't pull out the Ixora, just cut them back and low and behold, they have some little buds. I'm keeping my fingers crossed. I went ahead and put in some double knock out roses in the empty space. Just couldn't stand not having *something* there! I am continually amazed by the resilience of plants, Snap. The ones that I thought for sure were dead after this winter just keep coming back. The latest is another old split leaf philodendron. Just another lesson from Mother Nature that I need to be more patient! 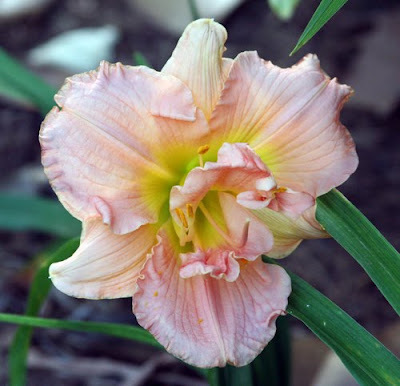 Wordless Wednesday: Mama's "ditch lilies"